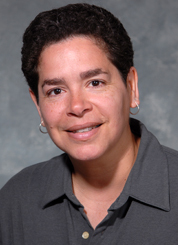 Evette Cardona is a Chicago-born Puerto Rican lesbian raised in the Bucktown/Logan Square community and a Senior Program Officer at the Polk Bros. Foundation. Evette received her M.A. from the University of Chicago, School of Social Service Administration, class of 1998, concentrating in Social Policy/Administration. Her internships were completed at the YWCA of Metropolitan Chicago, Women’s Services as a sexual assault counselor and at the Polk Bros. Foundation as a program officer intern. Prior to returning to school Evette did freelance photography and worked with teenage mothers and their children at Christopher House, one of the oldest settlement houses on the city’s North side, coordinating support groups, training former teenage mothers as peer leaders, and doing community outreach. She is the chair of the national organization, Funders for Lesbian and Gay Issues and a member of the Executive Committee of Chicago Latinos in Philanthropy ( CLIP ) . Evette is also very active in Chicago’s LGBTQ community in Chicago and was inducted into the Gay and Lesbian Hall of Fame in 2002 along with her partner of 12 years, Mona Noriega. She is co-founder of Amigas Latinas and Womyn of All Colors & Cultures Together ( WACT ) , a former board member of the Lesbian Community Cancer Project, a current board member of Chicago’s first LGBT community center, Center on Halsted and also a member of Chicago Foundation for Women’s Lesbian Leadership Council. For her work with Amigas Latinas, Evette was recognized with the Association of Latino Men For Action ( ALMA ) award for Community Leadership in 1997; in 2001, she was awarded the John R. Hammel Award from the ACLU – Chicago office, and in 2004 she received the Maria “Maruca” award from Mujeres Latinas en Accion and a Women with Vision award from the Women’s Bar Association of Illinois.